Should You Be Aiming Higher Financially? Do you sometimes get the feeling that you could be aiming higher financially than you currently are? Maybe you are comfortable and doing well just now but could it be time to move on the next level if this is the case? If so, how will you do this? I remember when I went for my first few job interviews I was really embarrassed to ask for a decent salary. My first job had a low salary and I ended up stuck in the same sort of poor earning power bracket for a few years after leaving this one. One day an experienced colleague pointed out to me that I should take more pride in my work and look for a bigger salary. I eventually did this and was amazed at how quickly I increased my earning power in the next few years. Take a few seconds to think about whether or not you earn the money you deserve for your talents and time. What do you think your retirement years will be like? Do you expect that you’ll have enough to live off but not have a great lifestyle? Now think about what your ideal retirement lifestyle would be. Would it see you travel the world, take the grandkids on holiday, live in a nice house and not have any financial worries? Why aim for something that decent when you could aim for something fantastic? You could be retired for a good couple of decades so it is worth setting your sights on making this a great time in your life. How will you do this? There are many different ways to finance a quality retirement, from stock market investing to property dealing and a lot more. However, before you think about each one of them you need to set your sights high and say that you are going to do your best to achieve to get a retirement lifestyle worth enjoying. I tend to feel a bit greedy whenever I long for a smart new car or a bigger house. After all, doesn’t this mean that I’ve got caught up in a shallow consumerism-led lifestyle? Maybe it does but these are things that we all dream of from time to time. Why settle for something you don’t really like all that much when you could aim higher and get something that you like a lot more? Have you become used to having a credit card balance and other types of debt? You might think that using a chunk of your monthly income to pay off interest is the only way of living but it isn’t. By making an effort you can get into a debt-free situation and find better uses for your money. This will put you in a far better financial position for the future and also let you sleep that bit more easily at nights. When you think about it, your financial goals go a long way to defining how you live your life. If you set tough goals and achieve them then it could mean a far better lifestyle for you. For example, would you live off passive income and enjoy more free time, or would you like to earn a lot more money than you have ever earned in your life before? Even if you try to achieve one of these goals and fall a little short there is nothing to say that you won’t at least improve on your current financial situation with the attempt. How would you choose to aim higher financially? Could You Handle an RV Retirement? When Is It Time to Settle Down Financially? 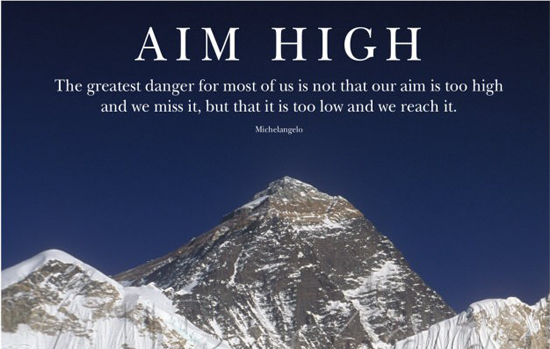 4 Responses to Should You Be Aiming Higher Financially? My mom has always said “I never aspired to be rich” to which I always replied “well I do.” I’m not sure why, but I think she always considered wealth to be anti-religious, or non-spiritual. Like the rich man getting into heaven and the camel through the eye of the needle story. Funny thing is, she actually ended up quite wealthy although she would never admit it. She always said that she had “enough”. Personally, as long as the wealth isn’t stolen, I don’t feel that God prefers you to be poor. Thanks Kathy. Isn’t it strange that people who don’t worry too much about money often seem to end up with rather a lot of it? I think that most people are embarrassed to ask for more money, or think that it’s wrong to think you’re entitled to more. However, it’s definitely a mind set I’m trying to change – for a better future!